A Fringe premiere from Kally Lloyd-Jones, the Scottish choreographer and director of Company Chordelia, this is an engaging meditation on the mysteries of creativity and madness. 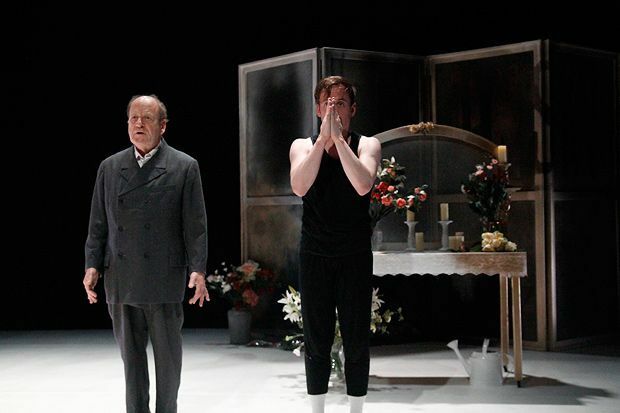 Both conditions were apparent in Vaslav Nijinsky, played here as an old and young man by, respectively, James Bryce and Darren Brownlie – an excellent double-act. Set by the designer Janis Hart in what could be construed as either a flower-filled dressing room and / or an asylum, and featuring an artful text by Michael Daviot, the piece presents an entirely humanising, two-for-one portrait of a 20th century dance legend. The intriguing central notion of a meeting (as well as the love and loss) of one’s self is realised with uncommon sensitivity and intelligence. En route there are, additionally, clever insights into an iconic career. Old Nijinsky acts as his own coach and critic, adjusting Young Nijinsky’s limbs in a few phrases from L'après-midi d'un faune. Together they manipulate, beautifully, a puppet Petruchka, while Le sacre du printemps is a solo for a tortured soul in a straitjacket. This somewhat episodic and repetitive show needs better transitions between scenes, plus a slight trim as it’s maybe a tad too in love with itself. But then I rather loved it too. So might you. Dance Base, 225 5525, until 23 Aug (not 17), 2pm, £10 (£8). Award-winning two man dance theatre piece that takes you inside the troubled psyche of legendary dancer and choreographer Vaslav Nijinsky.